Fast-forward, and a similar thing happened. Eve had been writing about wine while taking classes and attending events, since 2007. One day a non-profit planning a wine event called her for help. The word got out that Eve could use her new skills in social networking, as well as calling up her skills as a consultant, and soon a for-profit business planning a wine event called for help. 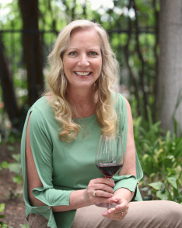 Eve has obtained a Level Two Intermediate Certification from the Wine and Spirits Education Trust, has been the subject of a 60-minute Wine Immersion video, authored “Wine Etiquette for Everyone” and recently served as a guest judge for the L.A. International Wine Competition. She has attended several marketing workshops and continuing education classes. She keeps up with the industry by being an avid reader of marketing books that focus on “out of the box” ideas. 2015 Update: Voted as the Ultimate Female Consultant by Elite magazine readers in their inaugural contest. Created, marketed and co-hosted “Cocktails on the Roof” 2015, an event that benefited the WiSH Education Foundation. 2016 Update: Created, marketed and co-hosted “Cocktails on the Roof” 2016, an event that benefited the WiSH Education Foundation. Honored as one out of five recipients, in the category of Philanthropy and Hospitality, in the Santa Clarita Valley Signal newspaper’s Top 51 awards. Working alongside her Vice President, Michael Perlis, the two started Eve’s Wine 101 Consulting. And soon, yes you guessed it, some of Eve’s former clients found her, and some new ones as well. Hence the latest morphing of consulting for both wine and non-wine based businesses, Eve Bushman Consulting. Pour Into Haiti, 2010, Benefit to support Three Angels Children’s Relief Fund. Relief for Japan, 2011; Benefit for tsunami relief. Dear Wine Friend weekly newsletter, copyright 2008. Twitter, Facebook (plus two group pages), Tumblr, YouTube (nearing 100 films), LinkedIn, TripAdvisor and Yelp (over 100 reviews).